In 1973, they discovered jazz rock, particularly the MAHAVISHNU ORCHESTRA, WEATHER REPORT and Miles DAVIS. This discovery laid the ground for their future compositions. They chose the name POTEMKINE for the strength and power it evokes, as well as for its phonetic qualities and Koba•an overtones (at the time, the band attended many Magma concerts). As early as 1974, they recorded a self-produced single : “MYSTÈRE/RICTUS”. Charles and Gilles had then been joined by a third brother, Michel, along with Maurice BATAILLE and Xavier VIDAL. In October 1975, the fourth brother, Philippe, joined on drums and Dominique DUBUISSON on bass. POTEMKINE released “FÎTUS”, its first LP, another self-production distributed on the Pole label. Touring began in the wake of the LP, first in small suburban venues, but they soon found themselves playing bigger audiences thanks to their growing success and to TARTEMPION, a non-profit organization putting up concerts. 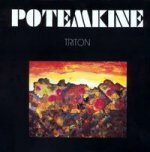 For the second LP, POTEMKINE, now turned into a trio, decided to push their musical quest further and to fuse jazz rock with early 20th century contemporary music which had by then become one of their major influences (VARESE, SATIE, DEBUSSYÉ) The result of those sonic experiments, the LP “TRITON”, was released in 1977. The title of the LP comes from the musical chord of the same name which in the Middle Ages was considered as the musical work of the devil (during the Spanish Inquisition, musicians were even burned at the stake for having played that particular chordÉ ). The chord was only reintroduced in Western music at the beginning of the 20th century, in particular by STRAVINSKY and BARTOK. After the recording of “TRITON”, a network of bands started to form, with ART ZOYD and MOSAIK in Northern France and ETRON FOU LELOUBLAN in the South, each band organizing concerts for the others. Touring increased, with POTEMKINE playing as many as 100 gigs in one year and opening for MAGMA on several occasions. On stage, the band would fuse the music from “TRITON” with high-energy improvised passages set in a more rock-oriented structure. As this was going down very well with audiences, POTEMKINE decided to explore that direction further. In January 1978, this new orientation was confirmed by the recording of the LP “NICOLAS II”, where POTEMKINE developed a high-class, energy-driven European jazz rock recorded in the spirit of a live act. The band was then composed of the three brothers, Charles, Michel and Philippe, and Doudou DUBUISSON. August of the same year saw them opening for SHAKTI, an evening culminating with John Mc LAUGHLIN’s warm congratulations at the end of their set. Touring continued with ever-growing success until 1979, the year when Charles GOUBIN died in a road accident on June 11th. POTEMKINE resumed touring though, and in August played a memorable concert in front of a crowd of 8000 in Bilbao, Spain, with Pierre BENICHOU on guitar and Gilles GOUBIN on cello. The band then had a break, touring having become more difficult with the times. In 1980, Gilles and Michel GOUBIN decided to turn professional and constitute the central unit of POTEMKINE as a quartet with RŽmy SARRAZIN on bass and Jean-Marc BELKADI on guitar. That line-up went on for a little over a year and disappeared in 1982 without having ever recorded. Apart from the original recordings, the two CDs “TRITON” and “NICOLAS II” contain the numbers from the “FÎTUS” LP as well as those from the single “MYSTÈRE/RICTUS”, thus offering POTEMKINE’s complete recorded legacy. (…) POTEMKINE were unique innovators themselves in French explorative jazz-rock, though almost certainly originally inspired by SOFT MACHINE. Formed by the Goubin brothers and Doudou Dubuisson, the band were pretty stable (adding a third Goubin on Keyboards), taking Zeuhl-isms and twisting them into a music of their own creation. (…) Their debut lp, aptly titled FOETUS saw a gelling of moody jazz forms, like a sedate ZAO, with many of the caracteristics we normally associate with the Canterbury scene. It would seem that working with VERTO after this rubbed-off on them greatly, and as a precise trio they came up with the Zeuhl masterwork TRITON, a condensing of those ideas Jannik TOP was all too rarely given ample room for in MAGMA, recomposed into fiery rock and jazz forms, all complex jigsaw-puzzles of riffs, motifs/refrains and solos, linked in a way unexplored except in more recent UNIVERS ZERO and PRESENT,… Barely 6 months on though it was all-change, moving to a more typically French lightweight jazz-rock with a funky edge. The 3rd Goubin brother was involved full-time with this one and I guess it is his jazz roots that tookover. 1978′s NICOLAS II is a fine album for fans of French jazz-rock. The true measure of the quality of an album is how well it stands the test of time. Potemkine passes this test exceeding well as these two albums that were both recorded over 20 years ago still sound fantastic. The band was active in their native France from 1971-1982 and they recorded three albums, all of which are contained on these two discs from Soleil Zeuhl. Potemkine had a very original sound that contained elements of fusion, Zeuhl, and 20th century contemporary music (influenced by composers such as Varese, Satie, and Debussy). Their classic second album, Triton, was a quartet effort that combined distinctly Zeuhlish baselines with a spare and somewhat dissonant acoustic piano to sound like Wiedorje combined with Univers Zero. The band had attended Magma concerts and eventually even opened shows for them, and they clearly absorbed some influences. Potemkine’s high-pitched wordless vocals add a sense of mystery, and overall the music can be moody and intriguingly dark in places. The third and final album, Nicolas II, was more fusion-oriented as the band had gone to an electric keyboard sound and had moved beyond the contemporary classical influences. One point of reference might be Return to Forever in their Hymn of the Seventh Galaxy phase, only with a better sense of melody. The two discs are packed with bonus tracks, which include all of their self-released first album, Foetus, as well as their first single. This means that these two discs contain the entire recorded output from this legendary band, and they also include excellent liner notes and band photos. The earlier material shows an evolving band but it is also very good with some strong guitar work and a violinist added to the quartet. Potemkine’s Triton and Nicolas II are outstanding achievements that rate with the best progressive fusion recorded in the 1970′s by any band from any country. If you haven’t heard these discs then you really owe it to yourself to investigate them.